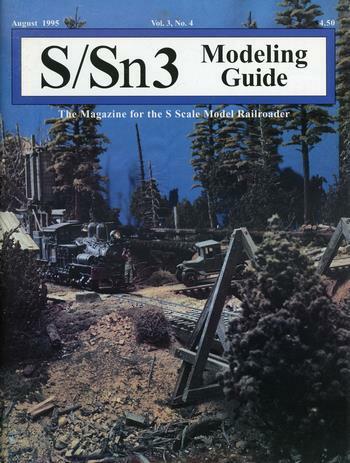 The June 1995 Model Railroader had a 8-page section in the middle of the magazine all about what is available in S-scale at that moment. The author is encouraging all to take advantage of this and help continue to promote and grow S-scale. How to handle it, and how to overcome it by pushing projects along just a little at a time. Comparing the current (1995) state of S-scale to the 1950s state of HO-scale. What caused the growth in S-scale in the 1970s? Is there really a superior scale to model in? Why would someone choose modeling in S-scale over any of the other scales? A visit to the Cass Scenic Railroad. Several prototype photos. A report about the show held in May 1995 in Palo Alto, California. August 15, 1945... President Truman Has Just Announced... The War is Over! Using a 1:35 scale figure to model a town's statue dedicated to the war heroes of WWII. This article is also a product review of the Building & Structure company's laser-cut low-profile crate used as a flat car load. A review of the 1995 NASG Convention in Altoona, Pennsylvania. Includes a number of contest model photos. A product review of both the DSL Shops' kit, and Roberts' Brick Mortar Formula.